I have been wanting to write about this topic for a while because it is something very close to my heart that I am truly passionate about. As some of you may know I am an enthusiastic babywearer. I fell into it almost by accident. I found babywearing because my oldest son was “colicky” which basically means his tummy was uncomfortable a lot of the time and he preferred to be upright and on my chest constantly. Babywearing was the solution for us. However, we got so much more out of it that I never even realised at the time. 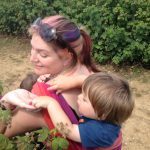 It was only later on, when I became a more experienced babywearer with my middle son that I began doing research into the connection between babywearing and communication. 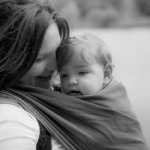 Babywearing has many benefits including comforting and bonding, supporting responsive breastfeeding, creating a secure attachment, increasing social interaction, supporting physical development, particularly head and neck control (an enjoyable alternative to tummy time for babies with tummy discomfort), sensory and vestibular development and supporting healthy hip development (if using an ergonomic carrier which supports appropriate hip positioning). Many of these benefits are foundational to the development of early communication skills, and they have lasting positive effects. How does babywearing impact early communication development? There are three areas I want to discuss in more detail. Closeness: It’s no secret that babies love to be held close. They enjoy the comforting touch and warmth of being held. While a baby is being carried either in arms or worn in a sling, they are elevated to the level of the adult’s face and even when worn on the adult’s back they are in close proximity meaning they can see what the adult sees. This establishes the opportunity for developing joint attention meaning that since the baby and adult can see the same things, they can engage in a joint activity more easily. It is also much easier for the adult to notice and respond to feeding cues and generally respond to baby’s needs which baby will be able to communicate through crying or facial expressions and noises are the most early forms of initiating communication. When we respond to a baby’s needs, they learn that they can have an impact on another person which is a fundamental to communication. We communicate to get our needs met. Face to face: Having baby and adult face to face means there are so many opportunities to engage in eye contact and baby is able to see facial expressions given by the adult and therefore spends lots of time watching and learning about non-verbal communication. Communication is actually around 90% non-verbal so this is a really fundamental skill, and babies have all the time in the world for enjoying being face to face. It creates more opportunity for children to hear and learn new words and watch mouth movements during talking or singing that is preparation for future speech development as well. Babies and toddlers develop speech sounds by watching, listening and imitating, and being face to face means they can watch, copy and engage in a verbal or non-verbal exchange much more often. A Better View: As we already mentioned, a baby being carried is up high, so not only can they see more but they are able to interact with more people because of this. The baby becomes involved in all of the adult’s conversations and is there for given increased opportunity for conversation by both the adult carrying them and other people who they can also see up close and enjoy experiencing different voices and facial expressions. I went out the other evening to a social event with my baby in a sling and he was having so much fun being involved in every conversation I had as people were able to look straight into his eyes and interact with him on a much more personal level. He absolutely loved it! Also, with a carried baby, the view changes all the time and they can see so much more making opportunities for exploring many different things near and far much easier. ♥Watch this video clip I made with my son for an example of some fun Babywearing Communication in action. Babywearing is a great way to start encouraging early communication development and is beneficial for all children including those with additional needs providing comfort and promoting secure attachment. It’s an enjoyable experience and a wonderful way to spend time with your child as you explore the world together. It also has a positive impact on emotional wellbeing and can have a lasting impact on adult-child relationships. ♥If you’re interested to learn more, I recommend reading Dr. Rosie Knowles’s book Why Babywearing Matters or visit her Facebook page Carrying Matters. ♥ Or read more information about safe babywearing guidelines. ♥For research articles on the specific benefits of babywearing check out Babywearing UK.